The Penguins have not trailed in the entire series. They lost in overtime in Game 3 but have never played from behind. As Sharks coach Peter DeBoer pointed out after San Jose's Game 4 loss, playing with a lead allows your team so many advantages, including sticking to your game plan, rolling four lines with rhythm and avoiding the temptation to force things in order to create offense. It's what San Jose had for three rounds before the Cup finals, when the Sharks constantly played with the lead. But it's Pittsburgh that has scored first and set the tempo in all four finals games so far -- a freeing feeling, to be sure, and one that allows the Penguins to not deviate from coach Mike Sullivan's plan. San Jose's lethal power play -- a weapon the Sharks employed with great impact in the opening three rounds -- has but one goal in the series. The Sharks aren't getting as many power-play opportunities as they did in the opening three rounds. But the Penguins have also clearly done their homework. Pittsburgh's penalty killers are anticipating some of San Jose's go-to plays, notably Joe Thornton either setting up Joe Pavelski for the one-timer in the slot or Brent Burns at the point. The Penguins have had active sticks, been in lanes and have been aggressive at the right times. So far 16 players have scored in the playoffs for the Penguins -- including Ian Cole and Ben Lovejoy in the Cup finals -- illustrating what a four-line, three-pairing force they truly are. The fact that Sullivan hasn't been shyabout putting his fourth line, centered by Matt Cullen, out against Thornton's top line says it all. Pavelski, Thornton, Logan Couture and Burns have no goals yet in the Cup finals thanks to a tremendous defensive job by the Penguins, notably on Pavelski, so far. The Sharks' captain entered the Cup finals with 13 goals in 18 playoff games, a seemingly unstoppable force -- at least if you asked the Los Angeles Kings, Nashville Predators and St. Louis Blues. Pittsburgh has done a great job of limiting time and space on the Sharks' top players. It seems like there's a Pittsburgh player right in their face as soon as they touch the puck. The Pens are simply smothering them. The best player in the world has been the best player in the Cup finals. No. 87's all-around game has been again on full display in the series, especially at the defensive end. He's the front-runner for the Conn Smythe Trophy as playoff MVP and has cemented that with an impactful championship series. 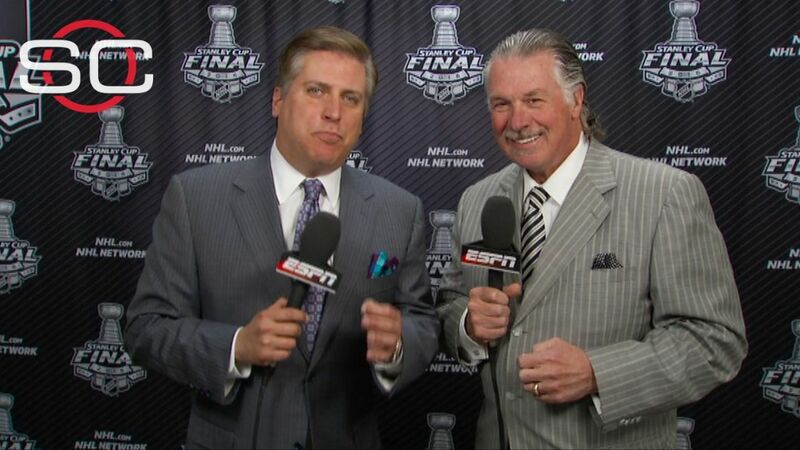 Barry Melrose breaks down how well Pittsburgh is playing against San Jose in the Stanley Cup finals after winning Game 4 and now being a game away from winning the championship.